OTTAWA — Canadians will see both health and economic benefits if the federal government follows through rapidly on draft regulations to crack down on pollution from coal-fired electricity plants, says newly released briefing notes from Environment Canada. The department also has identified the oil and gas sector as a "priority" in the next step of its climate-change plan to reduce greenhouse-gas emissions, according to the briefing notes which suggest draft regulations in that booming sector could be introduced this year. The documents, prepared in September right after the government had introduced draft regulations to crack down on pollution from coal plants, noted the urgency of delivering meaningful regulations for coal-fired electricity. "Economic considerations compel action now," said the briefing notes from Sept. 7, 2011, released to Postmedia News through access to information legislation. "The industry is facing major capital stock turnover." The background advice, approved by Mike Beale, an assistant deputy minister at Environment Canada, noted that two-thirds of coal-fired generation in the country or 31 plants, would be closing or coming to the end of their economic life by 2025, while 17 plants would close within the next three years. "Absent government regulation, industry may build new coal-fired units, which would increase the cost of future emissions reductions and lead to stranded generation assets." Coal was identified this week in a commentary by two climate scientists from the University of Victoria, Andrew Weaver and Neil Swart, as a major obstacle, along with other fossil fuels from the oil and gas industry, in efforts to reduce greenhouse-gas emissions that are trapping heat in the atmosphere. 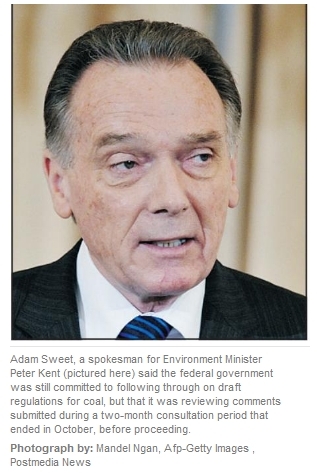 Adam Sweet, a spokesman for Environment Minister Peter Kent, said the federal government was still committed to following through on the draft regulations for coal, but that it was reviewing comments submitted during a two-month consultation period that ended in October, before proceeding. Environment Canada's published analysis of the draft regulations estimates the federal government will spend about $13 million over 15 years to enforce the regulations and monitor compliance. It also projects increases in consumer electricity rates over 16 years, in Alberta, Manitoba, Nova Scotia and Saskatchewan, ranging from $0.73 per month up to $2.14 per month, depending on the province. But the briefing notes touted benefits from "significant reductions" in both greenhouse-gas emissions and air pollution. "Canadians will directly benefit from cleaner air in their communities," the briefing notes said. The briefing notes also indicated that the department was proceeding with plans to introduce regulations for the oil and gas sector that successive governments and environment ministers, including Kent, have pledged for more than a decade. "We have started engagement with the provinces and industry on the development of regulations for the oil and gas sector, with a view to having draft regulations in (the official government Gazette) next year," said the briefing notes from September. But the department would not identify whether the oil and gas sector, including the oilsands which are considered to be the fastest-growing source of greenhouse-gas emissions in the country, would take up a significant share of reductions required for the Canadian government to meet its current international commitment of lowering annual greenhouse-gas emissions to 17 per cent below 2005 levels by 2020. "Greenhouse gas performance standards for the oil and gas sector will be informed by technology, sector-specific reduction opportunities and competitiveness considerations," said the briefing notes. Earlier this month, Kent said the federal government was proceeding with plans to regulate the oil and gas sector in the coming months.